AS A GRADUATE STUDENT, YOU'RE DIFFERENT. AS A GRADUATE SCHOOL, SO ARE WE. With over 1,000 Graduate students and over 45,000 alumni around the world, HPU is a global network for those who seek knowledge and those who seek to create new knowledge. 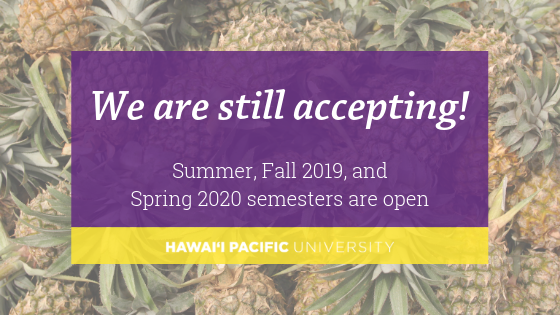 At Hawai'i Pacific University, a deliberately intimate learning environment, including classroom study and experiential learning, empowers graduate students to get up-close and personal with the subjects they are passionate about. You will find that knowledge is more easily grasped when you receive a hands-on education. It brings new perspectives and viewpoints that are uniquely yours into focus. *Entry terms vary by program. 8-week terms are accelerated and not offered for every program. We recommend application and required documents be submitted at least 1-2 months prior to the start of the entry semester. Did you know that HPU offers graduate degrees that can be completed entirely online? We provide flexibility for the working professional, complete your degree online with HPU.